Received October 12, 2018; Revised February 7, 2019; Accepted February 7, 2019. Iliac artery aneurysms are usually asymptomatic. Herein, we report a novel strategy for the repair of a pseudoaneurysm involving the external iliac artery using a conventional artificial graft and bare metal stent. A 76-year-old male patient presented with severe resting pain and right foot discoloration. 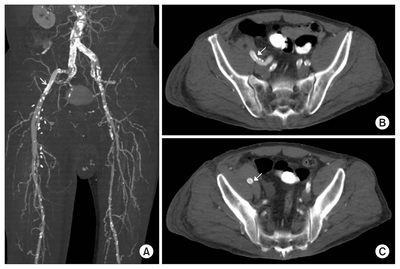 Computed tomography angiography revealed a right distal external iliac artery pseudoaneurysm, with severe calcified occlusion at the right common and superficial femoral arteries. After exposing the right femoral artery, long-segment endarterectomy and patch angioplasty with the ipsilateral greater saphenous vein were performed. Before the completion of patch angioplasty, a surgeon-modified 8-mm expanded polytetrafluoroethylene (ePTFE) graft was inserted for complete pseudoaneurysm repair. If a commercial covered stent is not available, minimally invasive endovascular repair can be safely performed using a surgeon-modified ePTFE graft and bare metal stent. External iliac artery pseudoaneurysms are caused by trauma, tumors, infections, vasculitis, atherosclerosis, or iatrogenic complications . These pseudoaneurysms usually remain silent; however, the consequences can be life-threatening when ruptured. Therefore, rapid repair is usually required because pseudoaneurysm rupture leads to shock due to heavy bleeding. Endovascular repair using a covered stent for pseudoaneurysm exclusion is currently performed to replace open surgical repair . Here, we report a novel strategy for pseudoaneurysm repair involving the external iliac artery using a conventional artificial graft and bare metal stent. The patient has consented the publication of his case. A 76-year-old male patient presented with severe resting pain and right foot discoloration. His past medical history included hypertension, end-stage renal disease with hemodialysis, and stroke. He underwent left iliac arterial stenting and right femoral artery balloon angioplasty due to a disabling claudication 7 months ago. After the procedure, the symptom persisted. In the last 1 month, his right leg pain became more aggravated and his right foot showed discoloration. He was then referred to Kyung Hee University Hospital at Gangdong. 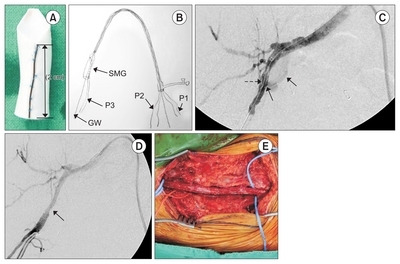 Computed tomography angiography (CTA) revealed a 28×30-mm-sized pseudoaneurysm at the right distal external iliac artery suspected with guidewire (GW) injury during the previous intervention, severe calcified occlusion at the right common femoral artery (CFA), and a 10-cm-long segmental occlusion at the right superficial femoral artery (Fig. 1). After exposing the right femoral artery, long-segment endarterectomy and conventional patch angioplasty of the ipsilateral greater saphenous vein were performed. Before the completion of patch angioplasty, an approximately 2 cm segment was retained and a vascular clamp was applied to the remaining portion. An 8-F hydrophilic-coated Ansel guiding sheath (Cook Inc., Bloomington, IN, USA) was inserted into the left CFA and pushed into the right CFA via an up-and-over technique (Fig. 2). A surgeon-modified 8-mm expanded polytetrafluoroethylene (ePTFE) graft (W.L. Gore & Associates, Flagstaff, AZ, USA) was made; the graft was beveled and measured 3 cm in length. A 0.014-inch, 2-cm-long Command ES GW (Abbott Vascular, Santa Clara, CA, USA) was attached onto the ePTFE graft using a 6-0 Prolene suture (Ethicon, Somerville, NJ, USA) as a radio-opaque marker (Fig. 3A). To properly position the ePTFE graft at the pseudoaneurysm, two 3-0 Prolene sutures were attached to the beveled side of the graft. These sutures were inserted through the Ansel sheath using a Gooseneck snare wire (Medtronic, Santa Rosa, CA, USA). Another 3-0 Prolene suture was suspended on the opposite side to maintain the ePTFE graft. A 0.035-inch GW was inserted through the graft for the safe delivery of the stent (Fig. 3B). The graft was positioned at the orifice of the pseudoaneurysm by pulling the Ansel sheath and proximally attaching two Prolene sutures. After successfully positioning the ePTFE graft, an Absolute Pro self-expanding stent (Abbott Vascular) measuring 8×60 mm was positioned within the ePTFE graft. After ballooning, completion angiography showed the complete sealing of the pseudoaneurysm (Fig. 3C, D). Patch angioplasty was then completed (Fig. 3E). Postoperative CTA showed a completely resolved right external iliac artery pseudoaneurysm and removed calcified plaque in the right CFA and superficial femoral artery (Fig. 4). Surgical repair is the conventional treatment for iliac aneurysms, with a mortality rate of approximately 10% . In the endovascular era, endovascular repair can replace the open surgical repair. However, there may be situations when a commercially available covered stent is not available. Therefore, a surgeon-modified graft can be used to successfully exclude an iliac pseudoaneurysm. During the endovascular treatment, the standard procedure of inserting an ePTFE graft for an aorto-iliac pseudoaneurysm usually requires a large sheath. However, this patient had already undergone left iliac stenting; in addition, CTA showed severe bilateral iliac artery calcification, which did not allow insertion of a large sheath. Therefore, a large sheath could not be used in our case. For these reasons, open external iliac artery aneurysm repair can be performed with bifurcated or straight polyester grafts placed using a transperitoneal or retroperitoneal approach could be performed. However, open repair can also be challenging in this case, due to severe fibrosis obtained in the previous intervention, making the dissection difficult. In other cases, deeply located aneurysm, especially in obese patients, is known to make open repair difficult. Under these circumstances, endovascular aneurysm repair without inserting a large sheath has the potential advantages of avoiding surgical procedures that typically require long hospital stays and are associated with high risk of complications . Since our patient had an atherosclerotic occlusion of the femoral artery in addition to the iliac pseudoaneurysm, femoral artery treatment should be considered after choosing the treatment method for the iliac aneurysm. In lower-extremity atherosclerotic obstructive disease, reversed autologous saphenous vein bypass is commonly performed in open surgery, if the greater saphenous vein is ≥5 mm in diameter. However, autologous saphenous vein bypass was not selected for this case of CFA occlusion, despite the relatively long lesion, because the vein branching led to marked decrease in the diameter. If the vein is not suitable due to diameter mismatch, endarterectomy procedures with patch closure may be performed. The autologous vein is the most commonly used option for patch closure during endarterectomy, as it shows good tolerance thrombosis, is resistant to restenosis, and is easily handled by vascular surgeons . There has been a shift in the treatment modality for lower-extremity atherosclerotic occlusive disease. Although endovascular revascularization is preferred more over surgical repair for iliac or femoral occlusive disease due to continuous advancements in endovascular techniques , there are still some concerns regarding the primary patency (PP) in endovascular treatments at the CFA. Among the 984 percutaneous transluminal angioplasties without stenting analyzed by Johnston et al. , 18 (1.8%) were performed for CFA lesions, with 1-, 2-, and 3-year PP rates of 59%, 49%, and 37%, respectively. Stricker and Jacomella  treated 33 limbs with focal disease at the CFA in 27 patients using percutaneous transluminal angioplasty and by implanting a single short stent . They reported that the PP was 66% at 30 months. Several other authors reported a better PP rate. Mukherjee and Inahara  reported a 5-year PP rate of 90% in 29 CFA endarterectomies with patch performed in 29 patients for claudication (59.0%) or critical limb ischemia (41.0%) . More recently, Kang et al. analyzed 65 CFA endarterectomies in 58 patients with and without concomitant additional endovascular revascularizations (hybrid procedures), proximally or distally to the target CFA. With a mean follow-up period of 27 months, the 1- and 5-year PP rates were 97% and 91%, respectively; more than half of the revascularizations were performed as a hybrid procedure. According to these studies, femoral endarterectomy is superior to endovascular revascularization in terms of PP . This case report has some limitations. As this represents only one case at our institution, we could not report on the mortality, complication, and patency rates. Another limitation is that many commercially available covered stents were available. However, in situations when proper pseudoaneurysm management has not been completely standardized and if the surgeon cannot use the conventional covered stent graft, we suggest that our approach be considered as an option for the treatment of pseudoaneurysms. Minimally invasive endovascular repair can be safely performed using a surgeon-modified ePTFE and bare metal stent if a commercial covered stent is not available for pseudoaneurysm repair. Fig. 1. 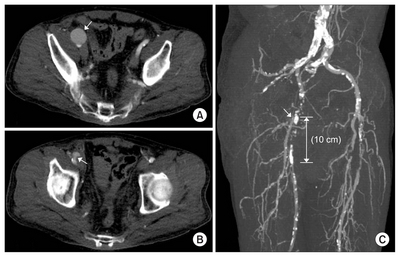 (A) Preoperative computed tomography angiography images showed a pseudoaneurysm on the right distal external iliac artery (arrow), (B) the orifice of the pseudoaneurysm adjacent to the circumflex iliac artery (arrow), and (C) a 10-cm-long segmental occlusion of the right superficial femoral artery (arrow). Fig. 2. 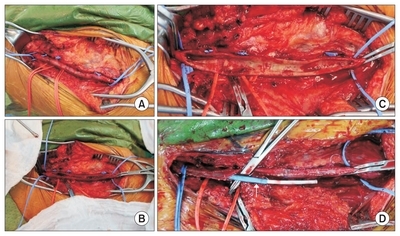 Long-segment femoral endarterectomy and placement of the guiding sheath. (A) After exposing the occluded segment including the right external iliac artery and femoral arteries, vessel loops were applied. (B) Arteriotomy showed calcified occlusion containing the organized thrombus. (C) Complete endarterectomy was performed, followed by the application of multiple tacking sutures. (D) After accessing the left common femoral artery, an 8-F guiding sheath was pushed out from the patch angioplasty site with the up-and-over technique (arrow). Fig. 3. Procedure details. (A) A 0.014-inch guidewire (GW) with a length of 2 cm was attached to the 8-mm expanded polytetrafluoroethylene (ePTFE) graft beveled at the proximal portion. (B) To properly position the ePTFE graft at the pseudoaneurysm, two 3-0 Prolene sutures (P1 and P2) were attached to the beveled side of graft. Another 3-0 Prolene suture (P3) was suspended on the opposite side of the ePTFE graft to maintain the graft. A 0.035-inch GW was inserted though the surgeon-modified graft. (C) The graft was placed at the site of the pseudoaneurysm (arrows). The radio-opaque marker is visible at the orifice of the pseudoaneurysm (dotted arrow). (D) Completion angiography showing complete sealing of pseudoaneurysm (arrow). (E) Finally, patch angioplasty was completed. SMG, surgeon-modified graft. Fig. 4. Postoperative computed tomography angiography images show a completely resolved right external iliac artery pseudoaneurysm (A) and removed calcified plaque from the right common and superficial femoral arteries (arrow). (B, C) Axial scan images show completely resolved pseudoaneurysm and patent graft (arrows). Sueyoshi E, Sakamoto I, Nakashima K, Minami K, Hayashi K. Visceral and peripheral arterial pseudoaneurysms. AJR Am J Roentgenol 2005;185:741-749. Ricciardi E, Di Martino G, Maniglio P, Schimberni M, Frega A, Jakimovska M, et al. Life-threatening bleeding after pelvic lymphadenectomy for cervical cancer: endovascular management of ruptured false aneurysm of the external iliac artery. World J Surg Oncol 2012;10:149. Lowry SF, Kraft RO. Isolated aneurysms of the iliac artery. Arch Surg 1978;113:1289-1293. Richardson JW, Greenfield LJ. Natural history and management of iliac aneurysms. J Vasc Surg 1988;8:165-171. Stewart GW, Bandyk DF, Kaebnick HW, Storey JD, Towne JB. Influence of vein-patch angioplasty on carotid endarterectomy healing. Arch Surg 1987;122:364-371. White CJ, Gray WA. Endovascular therapies for peripheral arterial disease: an evidence-based review. Circulation 2007;116:2203-2215. Johnston KW, Rae M, Hogg-Johnston SA, Colapinto RF, Walker PM, Baird RJ, et al. 5-year results of a prospective study of percutaneous transluminal angioplasty. Ann Surg 1987;206:403-413. Stricker H, Jacomella V. Stent-assisted angioplasty at the level of the common femoral arter y bifurcation: midterm outcomes. J Endovasc Ther 2004;11:281-286. Mukherjee D, Inahara T. Endarterectomy as the procedure of choice for atherosclerotic occlusive lesions of the common femoral artery. Am J Surg 1989;157:498-500. Springhorn ME, Kinney M, Littooy FN, Saletta C, Greisler HP. Inflow atherosclerotic disease localized to the common femoral artery: treatment and outcome. Ann Vasc Surg 1991;5:234-240. Kang JL, Patel VI, Conrad MF, Lamuraglia GM, Chung TK, Cambria RP. Common femoral artery occlusive disease: contemporary results following surgical endarterectomy. J Vasc Surg 2008;48:872-877.